This article is devoted to the sociological analysis of judicial proceedings in Russia. The study is based on data collected through participant observation in Russian criminal courts in 2014–2015. I focus on the following topics: public access to judicial proceedings, the orientation of judges towards the audience, ceremonial and procedural rules of social interaction and their enforcement, and transformation of the social status of a defendant during trials. In the theoretical section, I outline the differences between a theatrical play and a court hearing. Unlike in a theater, in a courtroom playing a role has consequences. However, the concept of performance remains useful in describing court hearings. The article offers three explanations of the performativity of judicial proceedings: political, legal, and social. The difference between the approaches is relates to the type of audience for which trials are performed: ordinary citizens, the judge, or the defendant. Analyzing the results of observations, the study tries to answer the question of who is the main audience in Russian courts. The reluctance to make court hearings more transparent and accessible to lay people, disregard for procedural rules, the violation of defendants’ rights, the frequently reduced procedures for examining criminal cases—all these factors affect public perception of Russian courts as places where fair justice is produced. I conclude that trials in Russia are a theater without a public, an argument without adversity, and a ritual without sacredness. Judges are engaged in routine bureaucratic activities where little space remains for making professional judgments and applying judicial discretion. Moiseeva, Ekaterina. 2018. “All Rise! The Court Is Now in Session: Judicial Proceedings As a Subject of Sociological Analysis”. 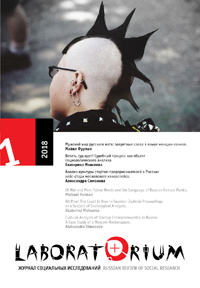 Laboratorium: Russian Review of Social Research 10 (1), 29-48. http://www.soclabo.org/index.php/laboratorium/article/view/674.